It looks like a costume, but Rowdy the Black Lab can’t take his mask off when Halloween is over. 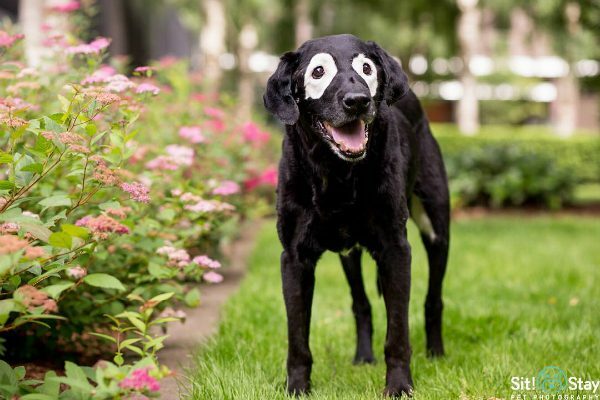 After developing the skin condition vitiligo late in life, the 13-year-old dog lives with stark white circles around his dark eyes. Now an advocate for humans with the same pigment issue, Rowdy proves masks aren’t always scary, but his past is as shocking as his appearance. “We got him when he was 7 weeks old,” explains Niki Umbenhower, whose family named named their dog after the canine character in the children’s novel, Summer of the Monkeys. The last 13 years prove the Umbenhowers picked the right namesake. “He did turn out to be very rowdy!” says Niki. A typical high-energy Lab, Rowdy was as unlucky as he was adventurous. By the time he was 5 years old, he’d had his stomach pumped after ingesting toxic pond water, developed a massive infection on his chest after retrieving a ball from a thorny bush, and had surgery on both ears after shaking his head so hard that he developed blood-filled hematomas. According to Niki, the dog has also suffered a torn ACL, had to have a toe surgically removed after an enthusiastic digging episode, and was once brought to the vet to have a tooth removed, only to have the wrong one pulled. Rowdy’s worst streak of luck happened 2010, when he was 7 years old. The Umbenhowers were at their son’s baseball tournament and had asked a teenage neighbor to stop by and feed Rowdy while they were out. Knowing Rowdy’s reputation for enthusiastically greeting visitors, the young man didn’t want to risk having his leg romanced by the Lab upon opening the front door. He decided to instead enter the home through the Umbenhowers son’s bedroom window, thinking Rowdy wouldn’t get as excited that way. “When he does this, the sweet neighbor lady across the way sees it and thinks we’re being robbed,” Niki recalls. The police department was called, and when an officer arrived, Rowdy — now fed and lying in the sun on the back deck — rushed to see this new visitor. According to Niki, the police department paid for Rowdy’s surgery and apologized. She says her family understood the circumstances around the shooting and was happy to forgive and forget as Rowdy got back on his feet. The shooting made the local news at the time, and six years later Rowdy is making international headlines after developing facial markings that resemble a robber’s mask. 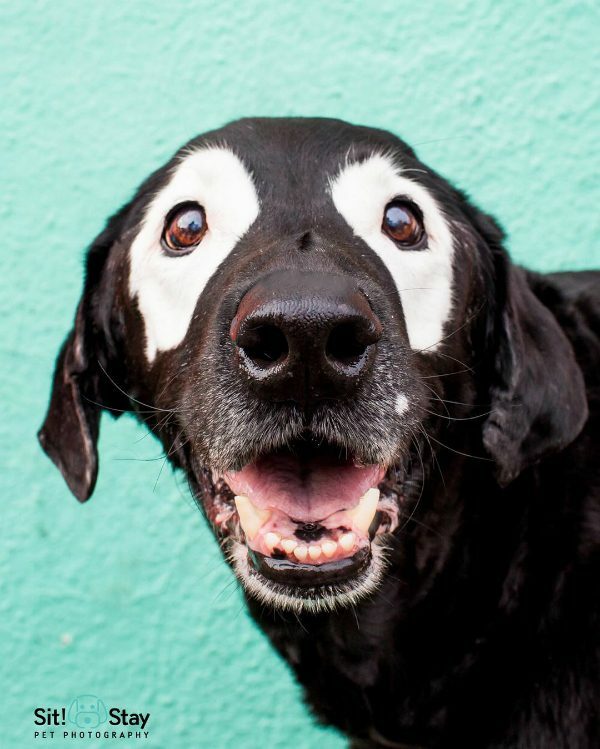 Niki now knows Rowdy’s mask is due to the skin pigment condition vitiligo (which also affects humans), but when it started to develop, she thought the then 11-year-old Lab was just showing his age. “I was like, ‘you’re getting a little grey buddy’,” she says, recalling how she first noticed the pigment change after snapping a picture on a family camping trip in August 2014. It wasn’t until months later when she took another photo that Niki realized Rowdy wasn’t going grey, but unusually white. As Rowdy met with veterinarians, his family launched an Instagram account and Facebook page, and soon the dog became the poster pup for his misunderstood condition. “The American Vitiligo Research Foundation reached out to me via social media and asked if Rowdy would be interested in doing YouTube videos to educate kids and raise awareness,” says Niki, who was happy to help. These days Rowdy is busy helping kids with vitiligo accept themselves and educate others. Meanwhile, his fans are helping him through a Go Fund Me campaign. The donations help the Umbenhowers with the costs of physical therapy for the arthritic, accident prone dog who found his purpose when he lost his pigment. “This is why Rowdy lived through all these crazy, near-death experiences, so that he could do this wonderful work,” Niki says. 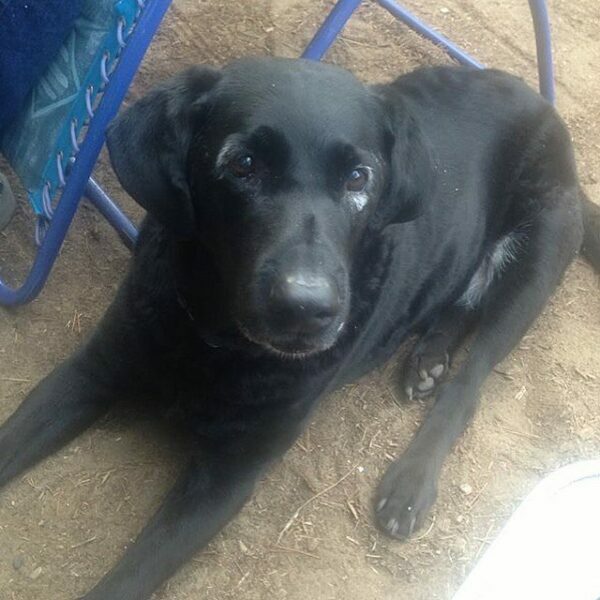 The post Rowdy the Lab Lost His Pigment and Gained a New Purpose appeared first on Dogster.